The impact of human apathy and greed on the environment is one topic that is on everyone’s mind these days. 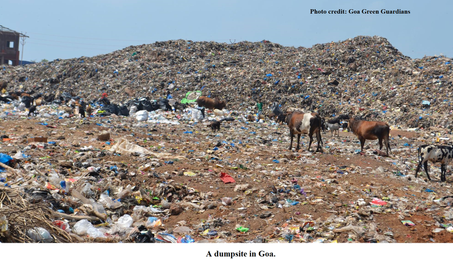 Accumulating mountains of garbage seems to be Goa’s particular problem in that department. It is encouraging to know that tiny pockets of Goa have people who are concerned enough to take matters in hand and make a tangible difference rather than entertaining people with words. Lata Seth and Jill Ferguson are two enterprising young women who have taken it upon themselves to inform and educate as well as conduct clean-ups with their own community in Arambol. Jill Ferguson is the co-founder and manager of Vaayu Waterman’s Village, and Lata is the founder and CEO of Vasundhara Productions. At the Temple of Dance at Arambol, Jill and Lata opened their home to like-minded individuals to present a workshop ‘Co-Creating a Sustainable Future’, to present systems and technologies that have been put in place by different organisations across Goa to diminish the garbage and pollution problem. The duo hoped to impress upon their audience the idea that these systems could be adopted by others as business owners and simply as members of a community. ‘We have a passion for Mother Earth and the practices that go into preserving her. We are not massive environmentalists but we want to do our little part in our businesses, houses and communities. We’ve done just little workshops, village clean-ups and beach clean-ups,’ says Lata, whose Vasundhara Productions organised an environmental film festival last year. Lata and Jill’s investigations of many landfills and dumpsites in Goa have revealed much to them. The dumpsite at Arambol, for example, is not only filled with unsegregated waste, its toxicity is damaging the health of those who work at the dumpsite. The disastrous effects of the combination of these waste products in causing chemical reactions that could lead to fires and such were brought to the attention of the audience. Aside from waste segregation at the source, it was suggested that the consumption of products that create waste be reduced, and the use of natural items that are easily biodegradable was encouraged. Jill continued speaking about the Arambol dumpsite saying that the waste was just dumped in a hole in the ground. Once that hole was filled it was covered up and another hole was dug. The dumpsite workers are not giving gloves, facemasks, or any other equipment for protection. They work long hours and are not paid well for their efforts. ‘We have to take ownership of our participation in this system. Since we are not segregating at source it is making their job that much more hard,’ say Jill. At Calangute they discovered that the waste that is not even buried amounts to 15 tonnes per day. The Saligao waste management facility that is being set up next to Calangute claims to have the ability to deal with a hundred tonnes of waste and is open to all of North Goa. But Jill, after referring the claim to other NGOs such as World Wildlife Fund, asserts that while the facility may not be able to carry through with its promise and the idea of segregating all that waste at the facility itself seems a gargantuan task, it is essentially a step in the right direction. ‘What most people don’t realise is that seventy percent of the oxygen that we breathe is produced by the ocean,’ says Jill, while explaining the effects of having garbage dumped into the sea. 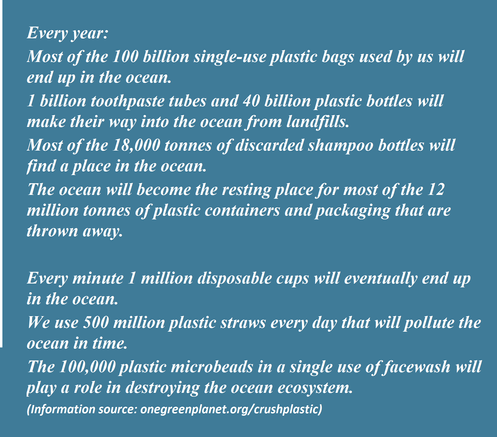 The plastic that is thrown into the waters prevents the plankton at the bottom of the ocean from producing oxygen. Trash is definitely an international problem with the sea’s ability to draw waste into the oceans and deposit it on a different country’s shoreline. Jill, who has spent four months living on a ship, has witnessed rubbish floating in the middle of nowhere. Waste should be segregated as organic, plastic, metal, e-waste, paper, batteries, light bulbs, and glass. Batteries and light bulbs should never be mixed with other waste, especially batteries because their chemical composition can lead to fires which are almost impossible to extinguish, a case in point being the recent fire at Mumbai’s biggest dump. 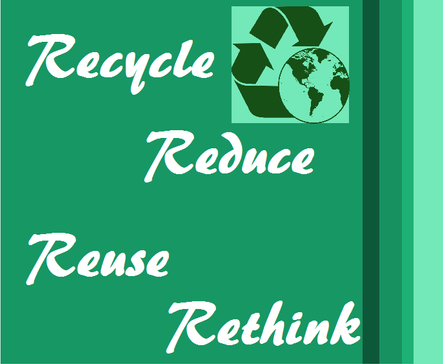 ‘Reduce, recycle, reuse and rethink’ is the motto to follow. Rethinking a product with plastic is essential because not all plastic is recyclable. Managing the waste problem at a decentralised level makes it easier to handle than dealing with it as a much larger problem at a centralised level. If we can combat the issue starting in individual homes, businesses, etc, we will have dealt with the waste problem in a much more effective and simple manner. There are hotels in Candolim and Calangute that have decentralised waste management systems involving composting, biogas composting, and wastewater treatment. Each of these systems corresponds with the capacity of each hotel. Composting is a way of turning your kitchen waste into a soil conditioner that introduces beneficial organisms to the soil. The waste management systems of one hotel had a four chambered composting unit. A layer of wet waste is covered with sawdust, or leaves, twigs and such waste. After this the EM (Effective Microorganism) is added. In a permanent brick and cement unit this mixture would need to be turned over from time to time to allow air to reach every part of the compost and prevent it from smelling. Each chamber will contain compost that is at a different stage of preparation. It takes some months for the compost to arrive at its final stage because various waste matter will decompose at different rates. The compost unit can also be made using wire mesh. This is a more mobile composting unit and requires less turning over of the compost. Blackwater is water that has a lot of suspended particles in it (eg the toilet), and greywater is wastewater from the kitchen, laundry, etc. The water treatment facilities turn black water into greywater so that it can be utilised for irrigation purposes or in your toilets again. This, of course, depends on how advanced the system is. Water treatment would be of great advantage to Goa because of the amount of wastewater that seeps into the water tables. This is owing to the lack or over use of septic tanks in many places. There are companies and non-profit organisations that can be approached for organic products, the installation of water treatment facilities or for composting units. Green Ok Please and Green Goa Works are two of them. For more information about other companies, you can become part of the group called Goa Green Guardians on Facebook (https://www.facebook.com/groups/483662288508115/) and contact Jill Ferguson or Lata Seth.